Paterson Simons and Pasico recently co-sponsored a 4-day event hosted by the 39th Council and Conference of Ports Management Association of West and Central Africa (PMAWCA) in Accra – and was represented by Pasico Managing director Mr. Kwaku Okoh and Mr Solomon Eshun, General Manager of Equipment Sales & Leasing. The theme for the conference was “Best Practices in the Management of Ports Lands”, and drew Chief Executives and Managing Directors of ports from across the West and Central Africa region. Valued as an opportunity for stakeholders and experts to discuss and debate the challenges of the region’s maritime industry as well as share ideas and solutions to the rapidly changing dynamics of the sector. The PMAWCA is an inter-regional economic organisation with members stretching from Mauritania, Cape Verde, Liberia, La Cote d’Ivoire, Ghana, Togo, Benin, Nigeria, Cameroon, Equatorial Guinea and Angola, including landlocked countries. 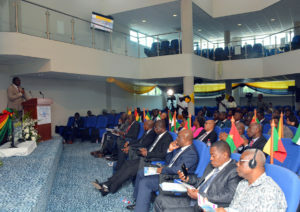 Ghana’s Vice President Dr. Mahamudu Bawumia opened the conference, which went on to feature expert speakers, including Director-General of the Ghana Ports and Harbours Authority, Paul Ansah. Mr Ansah spoke about some of GPHA’s revolutionary new processes, including a paperless system. The paperless clearing process has dramatically reduced the number of regulatory agencies undertaking inspections from 16 to 3, improving the turnaround time for clearing of goods, reducing cost and bringing about greater efficiency. The 40th Council meeting and exhibition will take place in Togo’s Lome port (where Paterson Simons has a significant crane sales and service presence at the LCT terminal). The event will take place 27 – 28 May 2019.